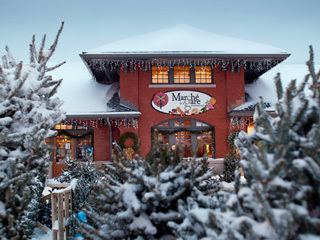 The Christmas market of the Marché la gare de Sherbrooke wows visitors and passers-by with a giant Christmas tree. This gigantic Christmas tree, located in the “enchanted forest” next to the terrace of the Savoroso restaurant, will undoubtedly make the holiday period an unforgettable occasion to share with your family or friends! Treat your loved ones to the crafts found at the artists and artisan’s market, where authenticity and quality are synonymous of local and environment friendly products.